Hunting, magic and art have been inextricably linked from the beginning. It could be that it was hunting that inspired people to make art. And it was art that became the implement of magic during the hunt. Since then works of art have magically evoked hunting success which was a necessity of life – specialists speak of “symbolic magic”. The result of the hunt is demonstrated and anticipated in symbols. The hunters paint the animal on the cave walls, to enchant it, so to speak. Prehistoric men symbolically threw the spear at the cave wall paintings and believed their weapons would hit the animal when the hunt was for real. 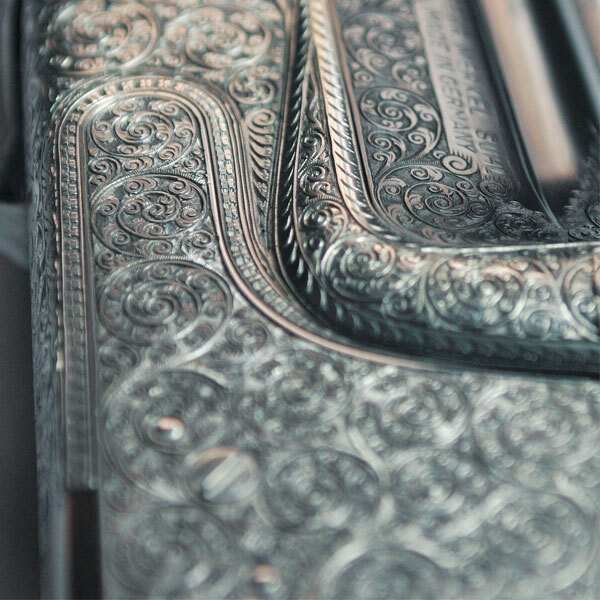 The engraving of the rifle emanates from the tradition of the symbolic magic. Two main categories of motifs can be identified: stylised tendrils – called arabesques. And the naturalistic motifs, according to Dürer, the so-called nature or animal motifs. 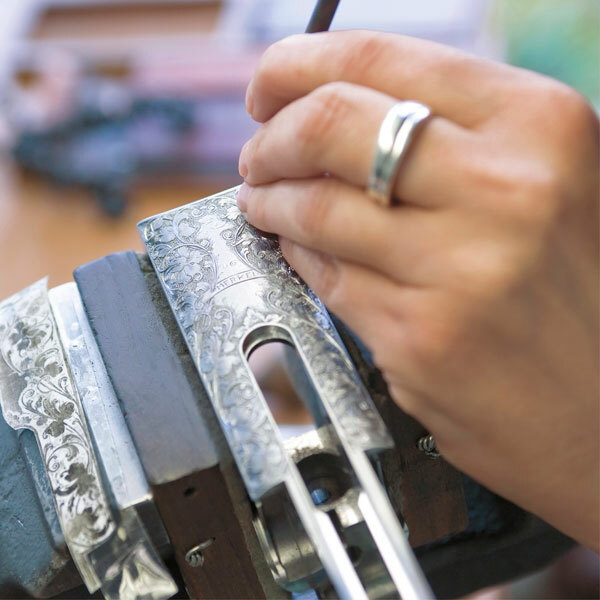 The first stage of the engraving work is transcribing the outline onto the workpiece. This requires a trained eye, scriber and steel compasses. The actual engraving is a metal-shaving technique. It is performed with a light hammer and graver. Gravers are fine chisels in various thickness with shaped blades and wooden handles. The workpiece is clamped in 360 degree rotating vice for processing. 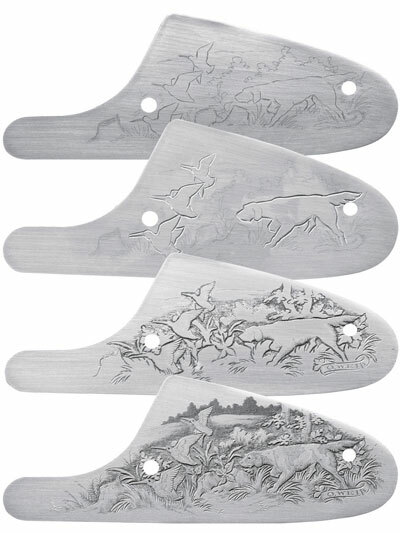 Fine shading is cut with a hand graver, used without a hammer and driven only by the strength of the engraver. 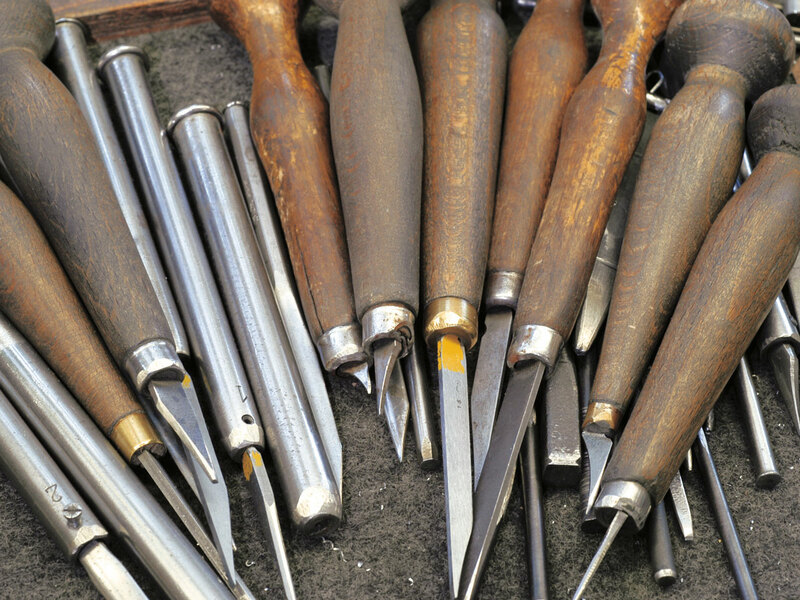 In Italian this graver is called “bulino” – this gives the name to this art form with the graver. 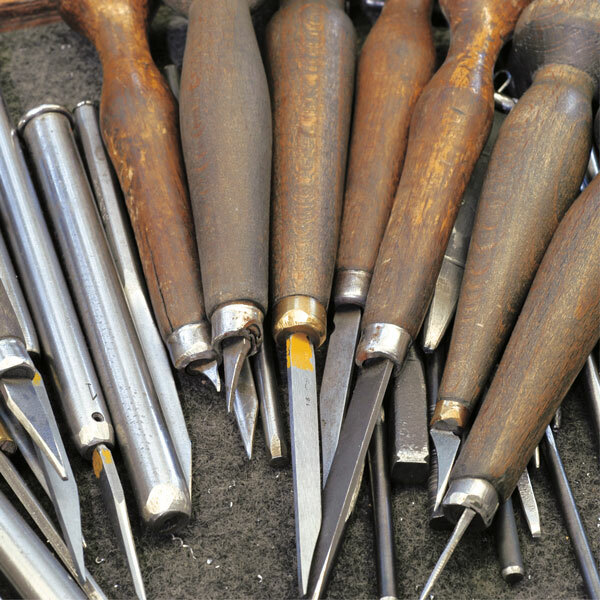 Files in various forms and cut levels as well as abrasive cloth in different grains round off the range of tools used by the engraver. 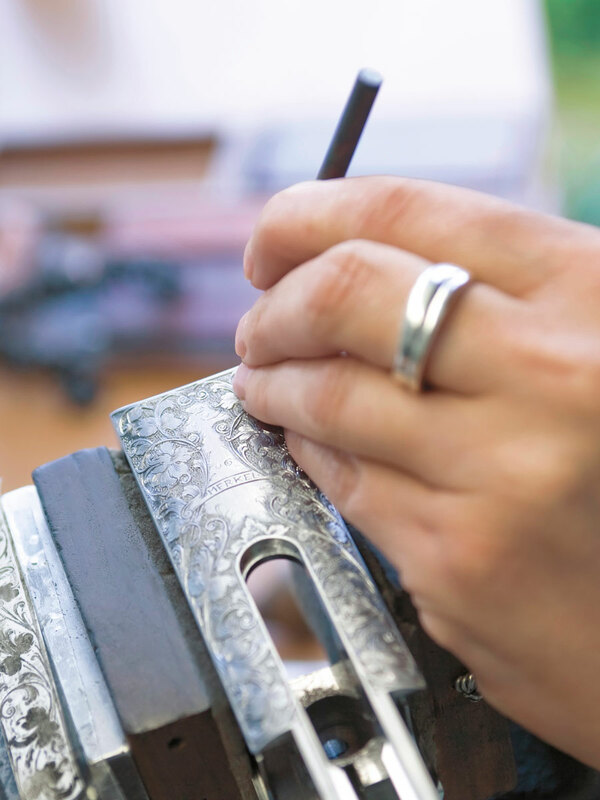 There is a diversity of other ornamentation form around engraving: colour case hardening, gold or silver inlaying, punching or chasing and inlaying with various precious materials. 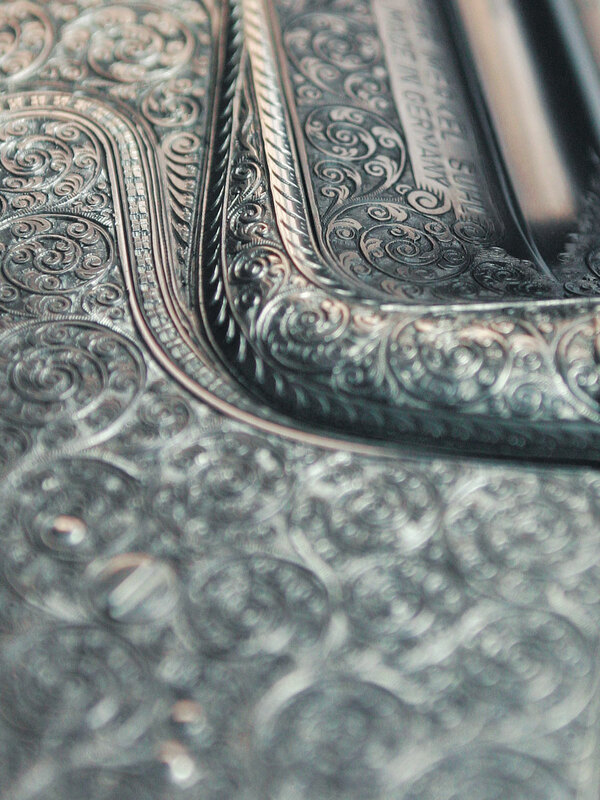 Engraving is a combination of handcraft and concentration. The men and women at Merkel process the hard steel for hours and make an organic work of art from the plain piece of metal that will adorn a hunting rifle. Engraving at Merkel is individual work: there are virtually no limits placed on the customer‘ s wishes. The following illustrations should therefore be taken solely as stimulating examples. Almost anything is possible.